When couples who follow a sustainable lifestyle decide to get married, they do not always choose to celebrate an ecological wedding. May be because one needs to have enough time for an exhaustive search between possible venues and other vendors who work with the same respect for nature as they have. Nevertheless, we encourage you to accept the challenge. You will see that with the following suggestions your green wedding can be feasible. It is essential that the ceremony takes place in a place where you have easy access to public transport, in order to not need the car to get there. If not, another option is to rent a bus to take everyone together at the same time. Ideally, it should be a day wedding to take advantage of the day light and the ceremony should be celebrated in the open air, for example, in the forest, on the beach, in a vineyard, garden or at a house in the country. 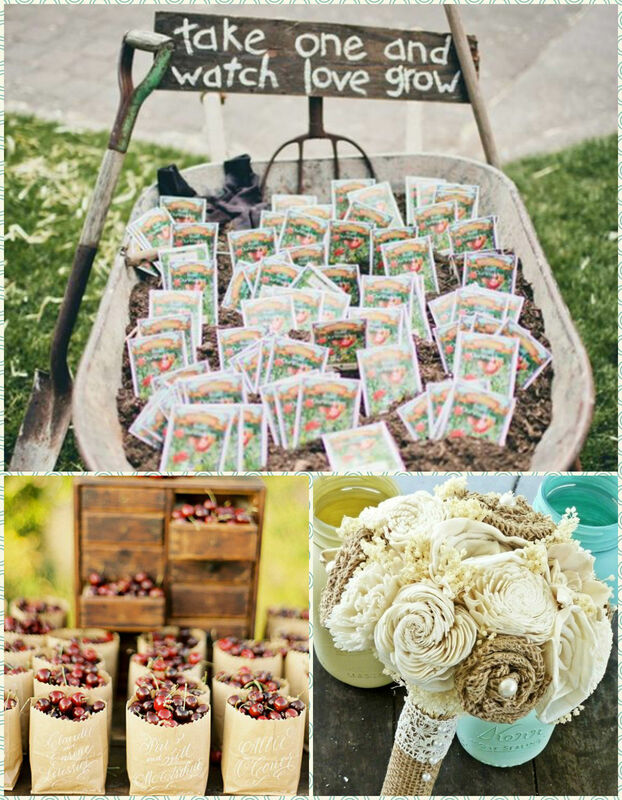 Have you thought of the possibility to get married in a vegetable garden, between tomatoes and scarecrows? Do you imagine the bride arriving by bike, wheelbarrow or on horseback? And for a special setting, recycled jars with wild flowers and other treasures of Mother Nature, such as pinecones, walnuts or simply leaves. Also little baskets with fresh fruit which you can eat afterwards. And after the “Yes, I do”, instead of rice or confetti, the guests can throw pieces of dry flowers, seeds, bird food, etc. The best thing to do is to celebrate the banquet in the same place where the ceremony takes place to avoid that you and your guests have to move. And, of course, the food should be entirely ecological, with local and seasonal products which have not been treated chemically. 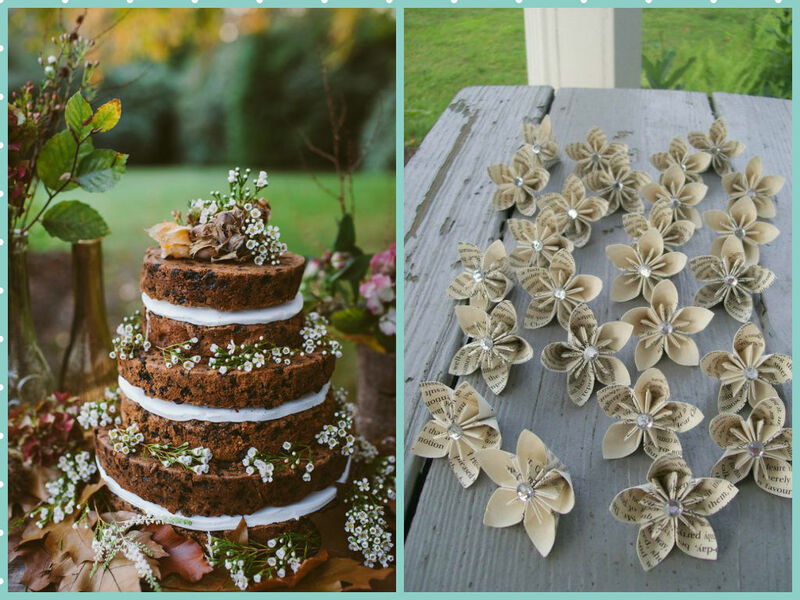 Everything will be completed with clothing napkins and tablecloths and a wedding cake without fondant (the famous “naked cake” which is the latest thing), nor figurines, or, if they are really indispensable, they should be made of recycled paper or cork. For the wedding rings we recommend the use of ecological gold or re-use jewels of the family, which is even more personal and emotional. The dress and the suit of the groom can be designed with natural clothing. Although, you can also rent, go to second-hand shops, re-use dresses or suits of the family, giving it a personal and alternative touch. The shoes can be of cork or esparto instead of leather. And the wedding bouquet with local seasonal flowers or wild ones picked from the meadow. There are plenty possibilities for the wedding favors created from the concept of sustainability, such as jars filled with ecological tea, candles and natural soap, seeds or bulbs, or little bags of raffia, sackcloth, jute or natural cotton. The invitations can be send by email, but if you are opposed to technologies and if you prefer something physical, make sure they are made of recycled paper or have another extra function afterwards, such as fans, coasters, bookmarkers, etc. We hope that the planning of an ecological wedding in the Basque Country with the help of these guidelines will be a lot easier for you!